If you have been wondering how you could give your regular facial a bit of an upgrade, you may want to think of giving your skincare a breath of fresh air. To be more specific, the ingredient to consider is 98% pure oxygen, paired with hyaluronic acid – in a treatment widely hailed by celebs like Madonna, Jessica Biel and Kim K. Futurethis Consultancy, the sole distributor of QMS Medicosmetics in South Africa, recently treated me to what is known as an oxygen facial. This treatment has gotten attention from its ability to reinfuse collagen deeply into the skin. 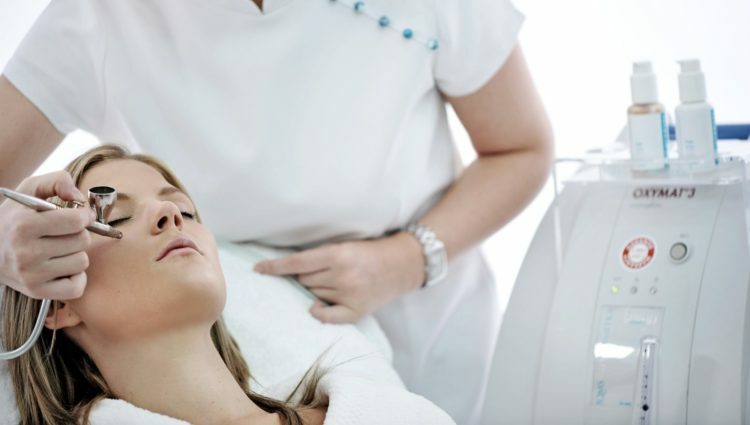 What is the oxygen facial? This treatment involves a 7-step collagen-infusing process, so it’s safe to say it’s quite extensive. The purpose of this treatment is to get rid of the dead, upper layer of the skin in order to stimulate the regeneration of skin cells and circulation at a deep level. After arriving at the clinic, I was introduced to the owner, Renate Klass, and my therapist for the morning, Jaslyn Ackerman. After getting dressed in a soft robe and climbing on the bed, Jaslyn inquired as to my primary skin concerns and explained the course of the oxygen facial. First, Jaslyn deep-cleansed my skin to remove any traces of makeup and debris, and to prepare it for optimal penetration of the active ingredients to follow. Step 2 was a fruit acid and enzyme peeling fluid that she applied to my face, neck and décolleté. This is done, she explained, to properly exfoliate the skin, refine the skin texture and address issues with tone and color. Hereafter came the fun part – though if you are claustrophobic, it may not be a good idea. Using a soft brush, Jaslyn painted an algae mask over my entire face, leaving only the front of my nose open so I could breathe while it dries. It is a thick, cold, rubber-like substance, which, after drying, gives an indication about the condition of the skin, while also cooling the skin down after exfoliation. After looking at the removed mask, Jaslyn informed me that my skin was dehydrated and congested. Luckily, this treatment was designed to address exactly those issues. Step 3 complete. 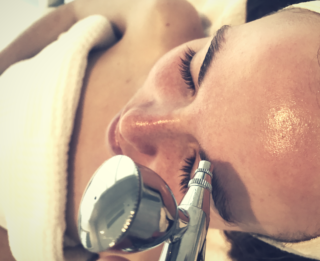 An important element of the oxygen facial is balancing the skin’s ph levels, which, if unstable, results in compromised skin. To do this, Jaslyn ensued with Step 4, which was the freshening tonic. This also ensures the best penetration of active ingredients. In Step 5, you get to the actual oxygen. Here, Jaslyn used the QMS Oxygen Energy Applicator pistol to spray 98% pure oxygen over my face and neck. As previously mentioned, the oxygen is then followed with a high concentration of high density molecular hyaluronic acid, which provides intensive moisture. Exactly what my dehydrated skin needed. The second-to-last step is the Activator Mask (yes, another mask) which containing protective marine collagen and more hyaluronic acid. This is like an additional moisture boost to seal up the ingredients which need to penetrate the dermis, and to plump and tone up the skin. Finally, Jaslyn applied SPF and an eye treatment to my skin to protect against sun damage afterward. Because the treatment goes quite deeply into the skin’s layers, she told me I could expect some breakouts in the following days. Sure enough, a day later my skin rebelled a bit, but it cleared up soon afterward. I was satisfied with the results of the treatment. With the exception of the first day, my skin felt softer and more energised. It also felt as though my own skincare and makeup sat better on my skin in the days following my oxygen facial, and less prone to oiliness come the afternoon. It was also gentle enough that my skin, which is prone to redness, did not inflame afterward. No downtime is required either – so it’s good for a lunchtime treat. A week later, things were still soft and fresh. Absolutely, especially if you have an important event coming up – the results are worth it.